I’ve never had a house that had a real pantry, as in – a dedicated one in the kitchen. I’ve always just made myself a pantry where ever I could squeeze some extra space. In this house I had a pantry in the shower stall of the downstairs bathroom that we didn’t use. Then when we remodeled the downstairs so that our daughter could live there, we moved the pantry to the closet of her old upstairs bedroom (which we now use as our tv room). Now that we’re preparing to sell our house, I thought I had better find a more traditional space for the pantry. So I moved things around and converted the broom closet into a pantry! It makes sense. It’s right by the kitchen. There’s a big hall closet that we can keep the brooms, vacuum, floor cleaner in and still have half the closet for coats and what not. It’s impossible to get a shot of the pantry from the front since it’s in the hall and there’s not enough space to be able to back up. So I’ll have to break up the photos. I edged the shelves with various washi tapes that I have and the back wall has some clearance wrapping paper from Target ($1.48 a roll) for a pop of color. I used some strategically placed thumb tacks to put up the paper and I didn’t bother with making it go wall to wall. I would have had to spend way too much time cutting and lining up the pattern! 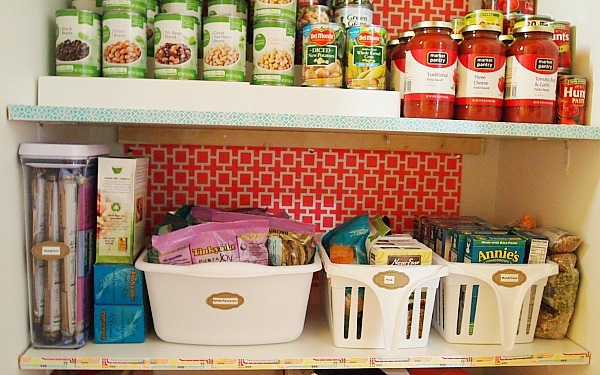 There are several ways to organize your pantry. I organized my pantry by food type and then grouped similar items within my food type categories. I kept my food in the original packaging. I should also point out that I do have quite a bit of storage in my kitchen and I keep my baking supplies (flours, sugars, oats, etc.) in my baking cupboard. Some flours (like almond flour I keep in the freezer as well as my yeast). I don’t keep a huge pantry so I don’t write the expiration dates on things since we go through stuff pretty fast and I restock accordingly but you may find that helpful. I placed my excess condiment type foods on one shelf. The clear bin to the left holds my large spice containers which I use to refill my small spice containers that I keep in the kitchen. You can see how I organized my spice cupboard here. 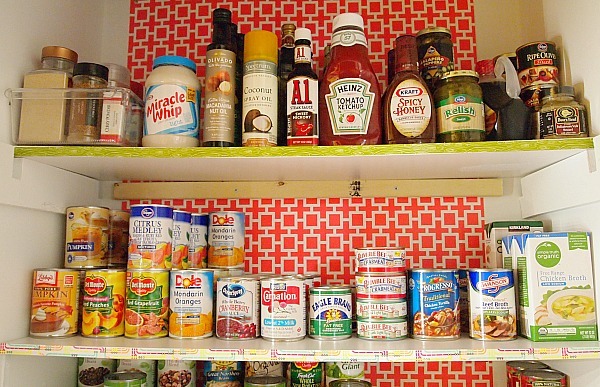 The second shelf is canned fruits, some canned soup for emergencies, broth etc. I used a stair step shelf for my canned beans/veggies. I chose this one from the Container Store because the shelves are deeper than the one you can get at Target/Walmart etc. The whole can sits on the shelf. I organized my beans by type (I add beans to lots of ground beef dishes I make and I make taco soup at least 1 or 2 x’s a month and that takes lots of beans). That way I know which ones need replenishing. Target had their pasta sauce on sale recently for $1 a jar and they had a coupon on their site so I stocked up! 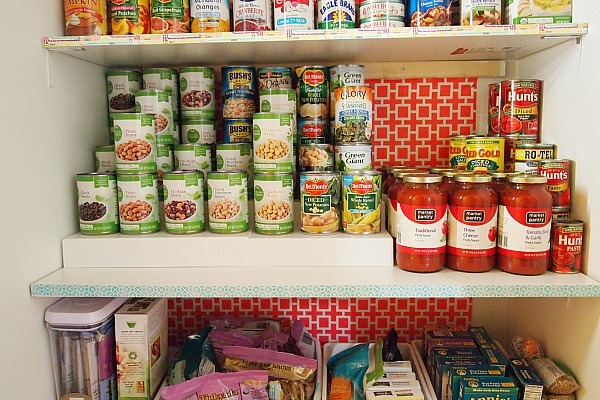 This shelf is organized by pasta, rice, dry beans. I used bins from Walmart to group like items. We only eat brown rice past now so that’s all grouped together. The brown rice rotini, penne, and spirals are all in a dish bin. I used a OXO pop container to store the spaghetti (there’s always at least one open bag). LOVE the OXO pop containers and I use them in my baking cupboard. The quinoa, couscous, rice is in one container. The rice pasta mac and cheese is in one container and I have some bags of dried lentils & beans on the end. On the floor I have soda, some oversized items, extra diswasher detergeant and a pull out stackable drawer organizer from Target. I keep my stuff for making hand soap, dish soap, extra foil, baggies, straws – that sort of stuff in those drawers. On top of the drawers we keep the box of garbage bags we use for the kitchen and napkins. 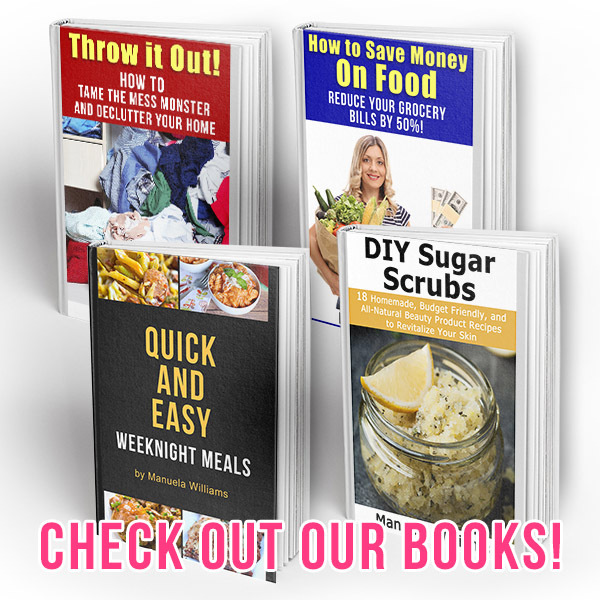 I hope you enjoyed the peek into my pantry and remember that everyone’s pantry is going to look different because we all eat differently and we all have different amounts of money to spend on groceries. 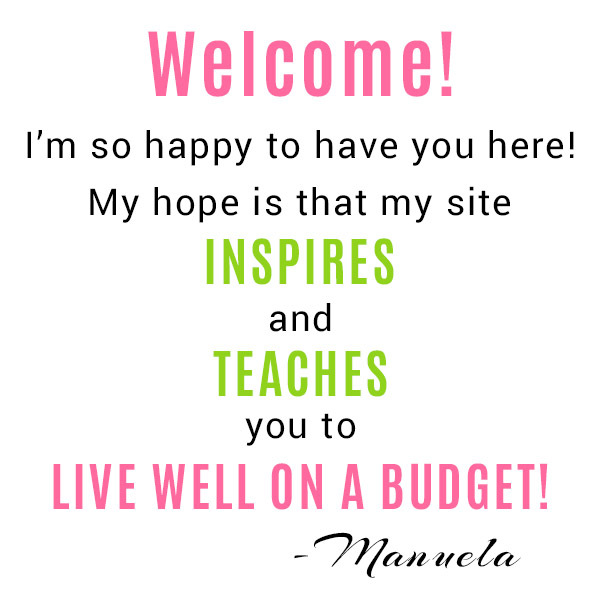 Great idea, Manuela, and so pretty and practical! You are so organized, too. I remember when we converted our storage room into a pantry, it was neat and tidy for about a month! But, it’s easy to organize and there’s no excuse – if you can’t find something in the pantry, then what’s the point, right?! 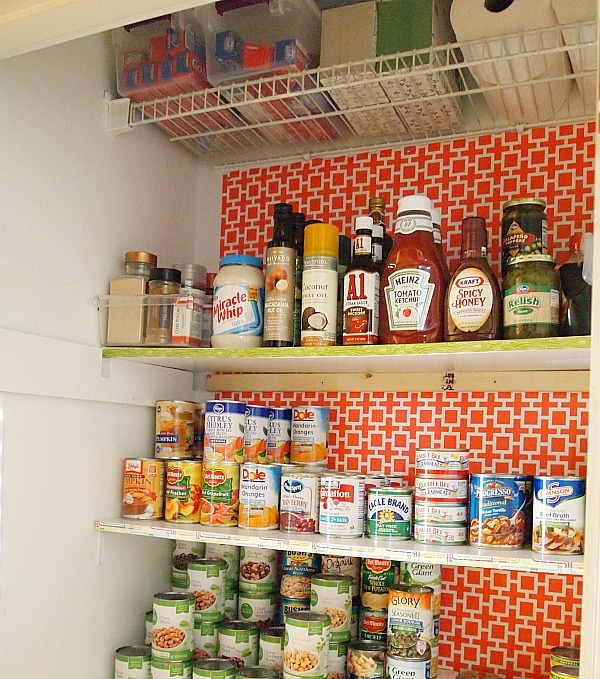 Manuela, I love the organization in your pantry…and the great happy wallpaper! Can you come and organize me? LOVE it! I really like the idea of storing your toothpaste in clear bins, I need to do that with more of my stock up items and it is such an obvious and normal way to do things, why didn’t I think of it? I see macadamia oil on your shelf (I feel like such a snoop!) what do you use it for? That’s all my $1 and under toothpaste. Most of it is Colgate. I guess Crest doesn’t go on sale or has as many coupons for some reason. I normally have a bin of deodorant too but haven’t found any good deals lately. Macadamia nut oil is even healthier than olive oil and has a higher smoke point than olive oil or coconut oil. It also is rich in phytochemicals which makes it less prone to oxidation ( so it keeps longer than other oils). Oh, it is so nice and organized! 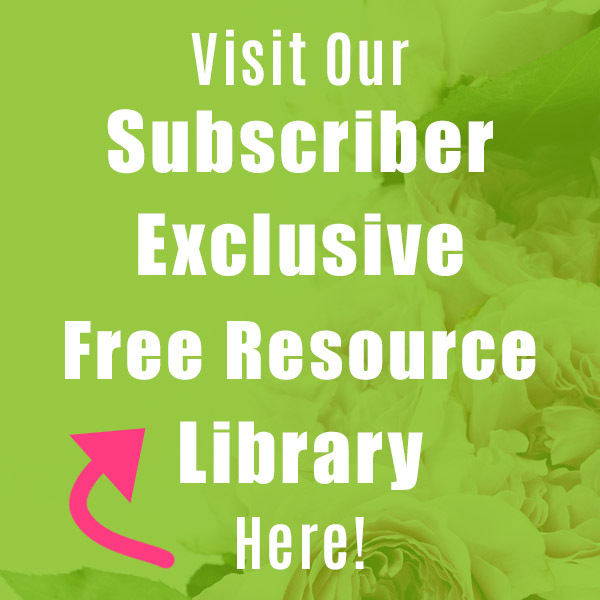 You have given me some great ideas on things I can do to keep mine organized! Thanks Alana! I’m so glad you got some organization ideas! Great job! Why is it that looking at a full and organized pantry feels so good? I love it! You did a great job, Manuela! I love how organized it looks. I try to keep ours organized the same way. I really like the step up shelves you are using for your beans. That would definitely come in handy for us with our canned veggies and soups. It makes it a lot easier to see what you’ve got. 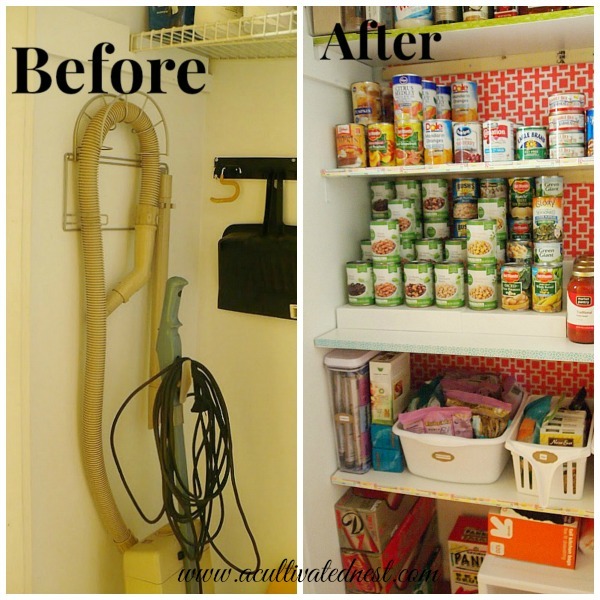 I like seeing a clean, well organized pantry/storage area, and you and husband did a great job on yours. My pantry is small,and usually stays fairly neat, but noticed yesterday it needs my attention. Looking mighty organized:) Mine is similar, just not quite as neat as yours! I have a pantry in my breakfast area that isn’t nearly big enough but it works! You make me wanna go clean it up! You inspire me, have I said that before? Of course I have:) Have a blessed week dear Manuela, HUGS! I did! And I need to do something similar. It’s just that I don’t know where the broom closet things will go…no room! I’ve been looking forward to seeing this and I am so happy for you. It looks great and will be so useful. People who really cook just need a pantry I think. 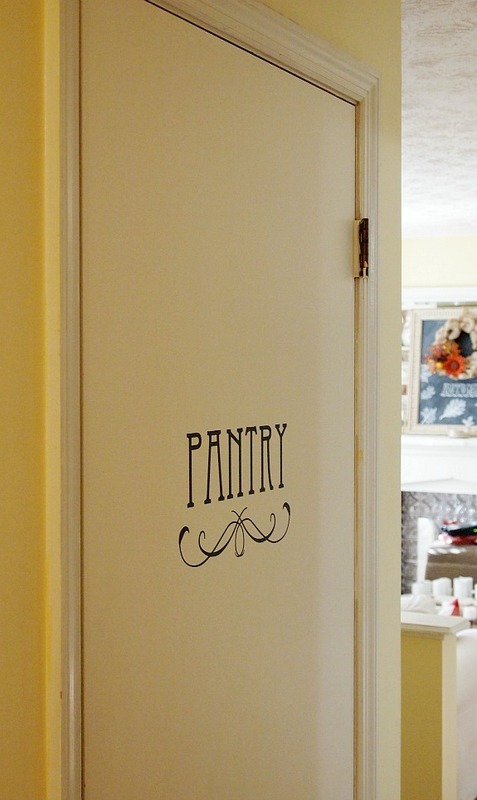 The pantry lettering on the door looks so classy. I bet you smile everytime you walk by and see it. Thanks Rhonda! I’m just so glad it’s finally done – it took me forever!! Great job on your pantry. I love how colorful you made it and your organizing skills are amazing. Have a wonderful week. You always have such good ideas for making something with very little or no money. I have never had a dedicated pantry either. There is nowhere In our kitchen that I could use and our broom closet is down the hall but maybe that might work. I’m going to give it some thought. Thanks for the inspiration! Thanks, so glad you like my little makeover. It’s hard when you don’t have the space. In one house I had no choice but to use the garage and another house I used the creepy basement. My MIL got one of those put it together yourself storage closets (KMart) and stuck that at the end of her kitchen counter to use as a pantry. Where there’s a will there’s a way! Wait!? Did you say you were moving? I missed something. 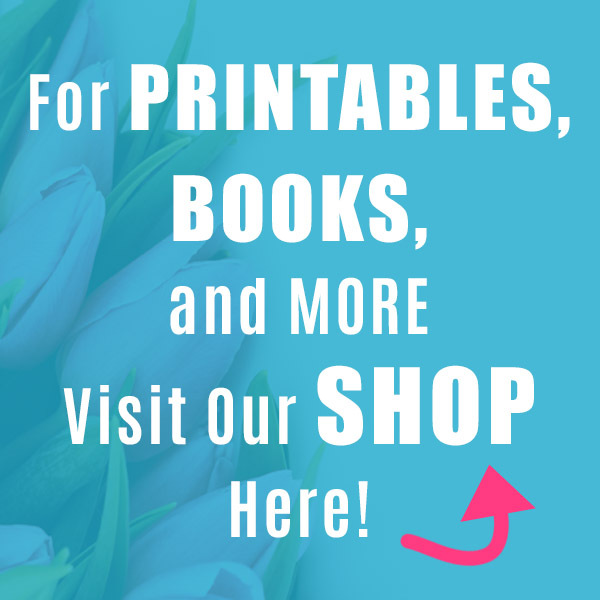 Will you have a new house to blog about? We plan on listing the house in the Spring. We’ve been wanting to sell for several years but the market was so bad that we decided to sit tight until things improve. So far housing prices have gone up and hopefully they will continue to. I’m not sure if we’ll be buying another house or renting a house since we haven’t quite decided where we’re going yet (we just started looking at different towns) and I’m not sure at this time if I’ll be blogging next year. It sounds like 2014 will be full of changes and adventure for you! I sure have enjoyed watching you create a home out of a house and hope you will continue to do so no matter where the road takes you…regardless, I appreciate the inspiration you have provided whatever happens in the future. Best of luck! What a perfect place for a pantry! So well organized, too. What’s this about you moving?! Oh we plan on putting this house on the market in March or April (whenever the the garden starts looking good). 🙂 So we hope the market has recovered enough around here to sell. If not we will probably rent it out. I like how organized everything looks. Now the challenge is to keep it that way, right?! You set up your pantry quite nicely. I love how organized it is and how easy you can find what you are looking for! Putting it in your former broom closet must be a wonderful convenience for you now! I have that wrapping paper! And I love that you used it to back your beautiful new pantry! What a great transformation! I popped over from A Bowl Full of Lemons– thanks for sharing! Thanks Lorraine! You really have to think outside the box when you’re working with a small space. Not easy! Oh that is lovely! You did such a great job and I love the way the washi tape picks up the red from the back wall paper. What fun! I love a beautiful before-and-after demonstration! Well done! 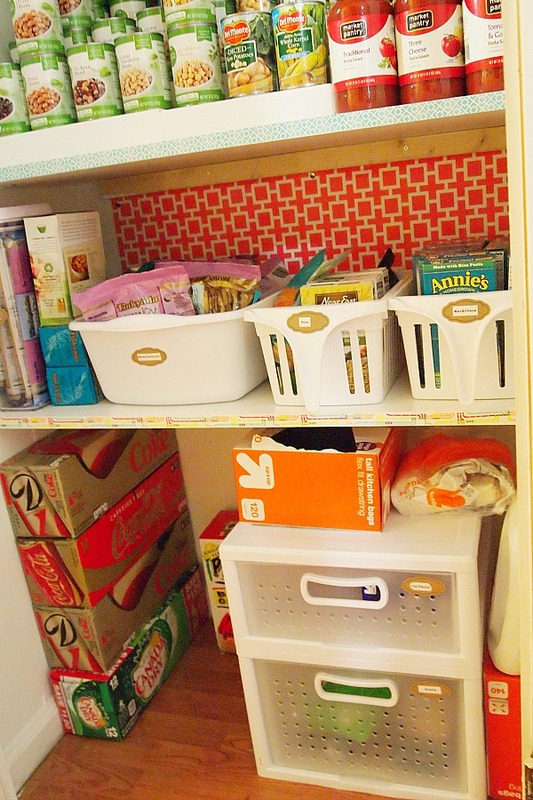 Your shelves and organization look awesome! I love the before and after pics. Such a better use of space!! We had a pantry very similar to this in the last house we lived in. It was seriously my favorite room in the house!